I’ve always had computers in my life. I started working with them in high school and have been involved with the computer world in one way or another ever since. I started out coding and network troubleshooting, where I met my partner Yossarian, and over the years my work has transitioned into the artistic end of the technology spectrum. I’ve also had a life-long passion for photography as well — combine these elements together and you have a happy and fulfilled Digital Artist, living and working in Ontario, Canada. 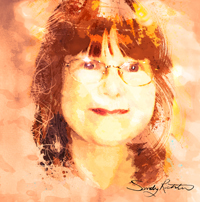 I specialize in digital mixed media, paintings, and photo manipulations. Commissioned artwork includes custom portraits, illustrations, and other projects for both digital and print use. My work explores many genres including contemporary, figurative, abstract and fantasy. My website is dedicated to all things art! Whether it be one of my creations or my appreciation of someone else’s artistic expression, you will find it here. I feel that art is everywhere you look and basically when you think about it ‘Life is Art! So… you will find art in many forms on my blog. My aim is to be entertaining and informative.